D.G. Adams is an accomplished singer-songwriter from Vancouver who started off his career as a classically-trained actor before finding the courage to finally release his own theatrically-inclined music. Following a string of successful rootsy folk albums which each build upon the work of its predecessor, Adams recently released his fourth album, Nest of Vipers. With artwork featuring a painting from Irina Miroslava that strongly calls to mind psychedelic album covers of the ’70s, Nest of Vipers has a sound inspired by the artistic, intellectual folk of Leonard Cohen, Joni Mitchell, and of course, Bob Dylan. After beginning on what may be an unintentionally humorous moment with “Fucker,” the album truly gets off to a proper start with the beautifully meditative and mystical “Queen of the Sky.” Adams comes close to the dark, brooding qualities of Nick Cave on the piano-led “Gravity” and there are many moments where he coolly channels Latin influences like “Platonic Lovers.” He attempts the blues on “If I Ever Had a Woman,” but the album is truly at its best on songs like “Father’s Day” where the sound is sparse, melancholy, and introspective. 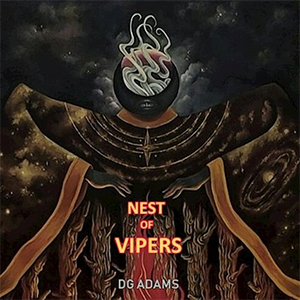 Adams proves himself capable of numerous styles here, and Nest of Vipers just might be one of his best albums yet.